This post is the third in my series on promoting books at conventions. In Part One I related my personal experience at AI Con earlier in the year. In Part Two I chatted to Rochelle Campbell about her experiences promoting her book at conventions. In this post, I talk to Rick Heinz. At the end of the series, I’ll produce a consolidated tip sheet incorporating suggestions from all the participating authors. Richard Heinz is as an electrician with a deep interest in politics, symbology, and― not to mention — countless caffeine-driven hours spent playing Diablo. 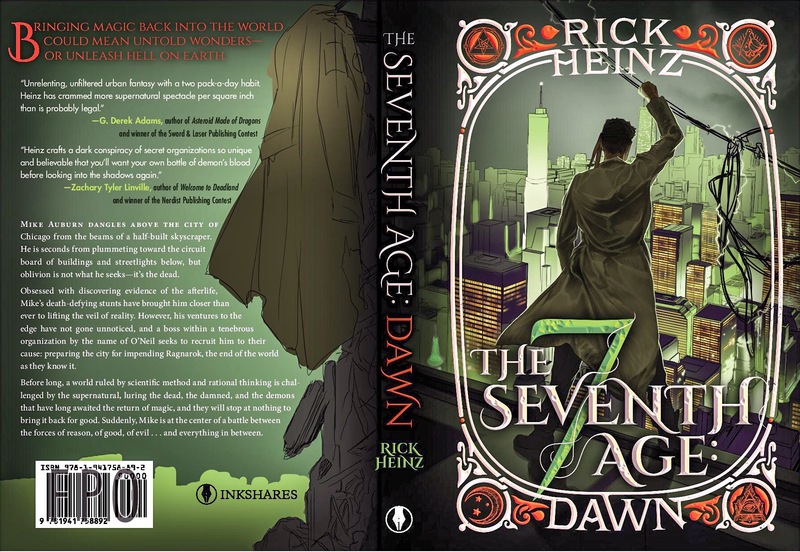 The Seventh Age: Dawn is Rick’s first book, as well as book one in the sprawling urban fantasy epic, The Seventh Age Series. When he isn’t navigating the labyrinthine corridors of his own imagination, Rick works as a project manager in Chicago. What conventions have you attended? Why did you pick those conventions? In hindsight, were those reasons valid? I've attended everything from Anime Conventions, Gaming Conventions, General Sci-Fi Fantasy Cons, Comic-Book Cons, and a small local con. I picked these conventions for a variety of reasons: Target Audience, the LACK of other authors at them, location, and most important — I won the artist alley lottery. What is often left off a selection of why to attend a con, is that you usually must register a year in advance and it's a lottery system. You can apply for 15 cons and end up getting into zero. What were your objectives for the conventions you attended? Do you feel you achieved those objectives? Direct Book Sales. I once went to a con for the intention of pre-orders, and it had some success. But I've been peddling the actual book since it was released. My average con sales over a 3 day event is around 50-60 books on average, so to that end, its been a moderate success. What was your strategy for engagement at the conventions? Well, first off, I'm a giant geek whose been at conventions my entire adult life. So the strategy for engagement is pretty easy: Find something you are passionate about and engage in that. Standing behind a table, talking about games or other things with people, and then having a polished book pitch is my thing. I've got a pretty solid book pitch I can deliver in less than 15 seconds that hooks most people in. As for my display, I've invested a solid amount of money commissioning artwork, banners, floor stands, and even scenes from the novel. Paying for top-talent art was an investment, and well worth the pay off. Most people come up because of the pictures. As for physical books, I've always had them on hand and sold out a few times now. But, it's clear that if you are going to work the convention circuit, having a quill book or being self-published is the better avenue. What did you feel worked well? Making connections with other artists and industry contacts. I've often found other artists to work with, or even other people looking for writers. Working behind the table has opened up more than a few doors. So on an industry level, it's worked out very well. As for moving physical books, I've had a lot of success with it so far. We will never be on the level of art dealers with prints, but an author can move plenty of books if you are comfortable talking. What didn't work, or not as well as you had hoped? Being published and selling the book at cons. It's a little rough on the math to sell your book at a con if you have to go through a publisher. Look around any convention, and you'll find that the only people in artist alley that are authors are self-published. It's almost impossible to recover the costs of a convention between travel, hotel, and table cost as an author. So, don't go if that's what you are looking for. Most of the published authors are part of the publishers exhibitor booth doing book signings, and perhaps someday, that can be a realistic dream. For now, it's not, and so you'll have to swallow some convention costs for a while. If you are self-published however, you can be successful at a convention and cover yourself for the weekend. What other lessons have you learnt? Stay positive and put in the hard work. The weekend is going to be draining. Go to bed early, resist the urge to drink till 2 am, and plan ahead to show up on time. This is a job you will work for 12 hours a day on the weekend. Plan ahead, and get your cons booked a year out. This isn't a gig for people who just want to do stuff on the fly. Do you plan to attend more conventions to promote your book? I've got an entire year booked! Next year, I'll even have GM's running the Seventh Age world as rpg tabletop events in addition to the booth. At this point, it's not really book promotion. I'm just going because I already attend a lot of cons, and so why not double up and do some book promotion while I'm there! I'm enormously grateful to Rick for sharing his experiences. Anyone who enjoys urban fantasy should definitely check out his first novel, The Seventh Age: Dawn. "Before the age of reason and science, magic ruled the world. Now, it’s coming back and if most of humanity gets wiped out in the process....well, sometimes you have to break a few eggs."